Railfuture Scotland is delighted to celebrate the reopening of Borders Railway after campaigning over many decades. Almost all of the 50km-long new line has been rebuilt on the existing route along the Waverley Line that was closed back in 1969, which went to Carlisle. The new Borders Railway only reaches as far as Tweedbank. It branches off after Newcraighall, with seven new stations built: Shawfair, Eskbank, Newtongrange, Gorebridge, Stow, Galashiels and Tweedbank. Track laying took less than five months commencing on 6 October 2014, and finished in February 2015. That was followed by signalling and testing. The total cost was £353 million, of which £295 was construction costs (in 2012 prices) with less double track than originally proposed meaning that meeting punctuality targets is challenging. The passenger service re-commenced, after 46 long years, on Sunday 6th September 2015. However, on 5th September there was a 'Golden Ticket' holders' day for local people to try out the railway before the start of the public service the next day. 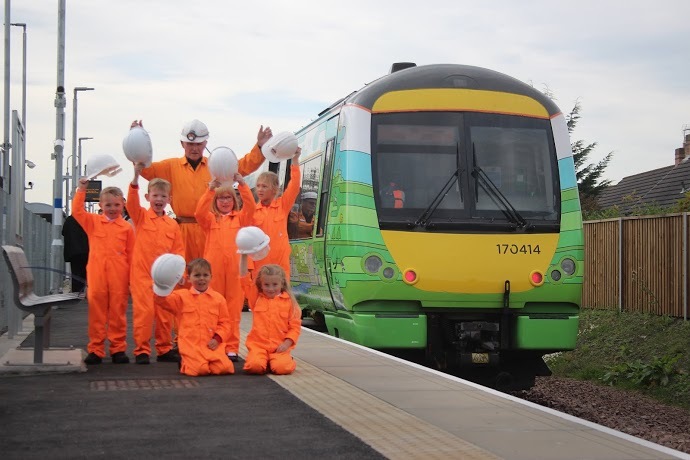 Many of the photos on this page were taken by Railfuture members, including Chris Austin OBE, head of Railfuture's of its Infrastructure and Networks Group, who was also responsible for ATOC's "Connecting Communities" report that proposed reopening several railway lines. Another photographer is Allison Cosgrove, chair of Railfuture Scotland, who was invited to the 'Golden ticket' day, and has written a personal account of it here. In the first three years since it opened there have been more than four million single journeys, with 1.5 million in the third year alone. From the first month the indications were that the line was being very well used, and patronage soon settled at over 20,000 per week, which is one million a year, and about 40% more than envisaged for the first year. According to sources "overcrowding on the Borders Railway had reached such a point during the October 2015 mid-term school holidays in Scotland that (because of a shortage of carriages to make the train longer) replacement buses had to be used", and the large car park at the Tweedbank terminus was in need of an 'overflow' area on some days. Patronage at Galashiels and Tweedbank has been many times higher than forecast. The good news is that passenger facilities including toilets and refreshments are oging to be provded at the Tweedbank terminus. Their omission was a cost-cutting mistake especially as toilet facilities existed in the staff building adjacent to the station car park. 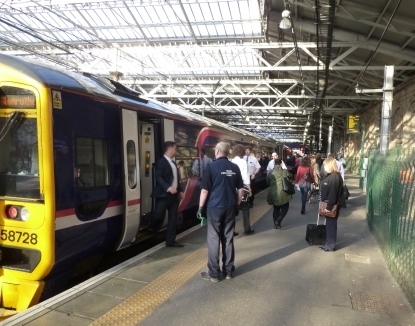 Taken on the first day of commuting from the borders, 200 passengers pour off the 07.28 from Tweedbank at Edinburgh Waverley. Chris Austin says "The crowded train provides a simple and direct answer to those who claimed that the Borders line would be a 'white elephant.' It clearly isn't." Chris Austin who was present on both 5th and 6th September writes: "Throughout the day the six-car trains have run full in both directions. 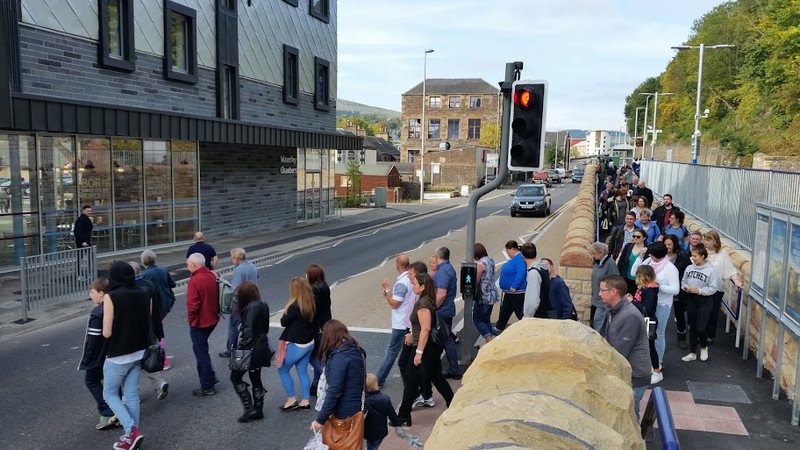 I have just returned from Galashiels and would estimate around 150 people joining there a train that already had 200 on from Tweedbank. The train today must have brought thousands of tourists to the Borders and taken thousands of Borders residents into Edinburgh. A very scenic route and a good range of destinations served by connecting bus from Tweedbank, make this a highly recommended trip for Railfuture colleagues." 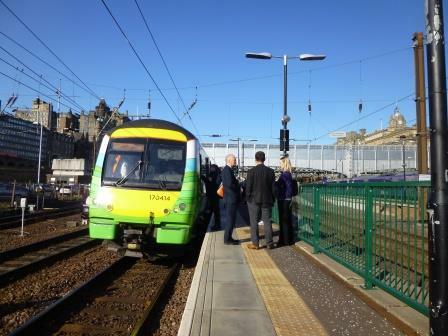 This is the first train from Edinburgh (09.11), a class 170, ready to leave for Tweedbank on 6th September. The platform is fairly empty as most people have already boarded. They needed to as all the seats were occupied! Second train arriving at Tweedbank is full too! 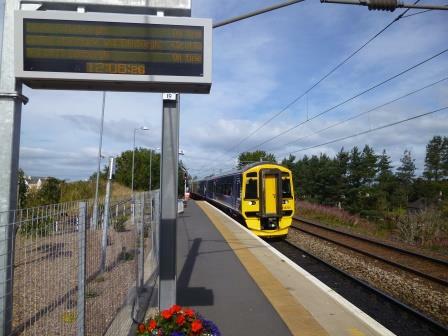 There are large crowds at Tweedbank as the second train (10.11 from Edinburgh) arrived on 6th September 2015. 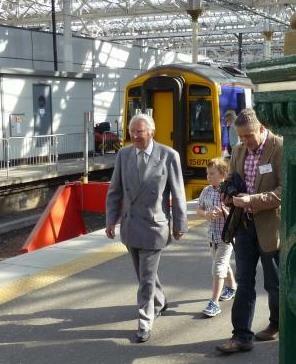 Lord Steel walking along the platform at Edinburgh Waverley having alighted from the first train from Tweedbank on Saturday 5th September 2015. Of course, he was on the last train in 1969 as well, and was involved in the famous incident at Newcastleton on that day when protesters against the closure blocked the last train there. 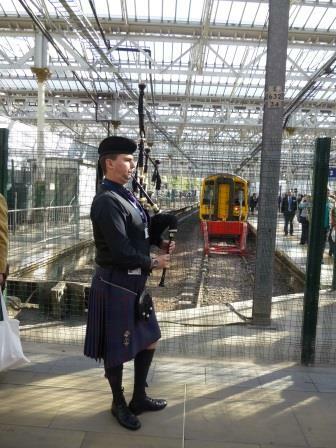 As the first train from Tweedbank pulled into Edinburgh Waverley on Saturday 5th September 2015 a piper was waiting. The 11.55 from Edinburgh to Tweedbank (on Saturday 5th September) running through Newcraighall during early afternoon. It is formed of six cars (three class 158 units). Buses replaced trains to keep the line clear for these specials, but from the first day of public trains (6th September) the Tweedbank trains called at this park and ride station. 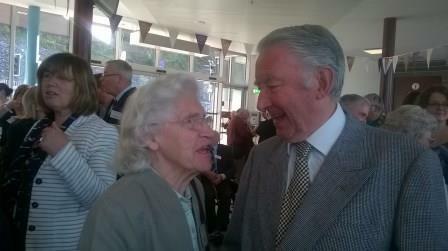 Madge Elliot who led a petition against the closure in 1969 and Lord Steel who was a young MP at the time, relive old times at the new Galashiels station building. Network Rail hangs large (impossible to miss) banners from the roof of Edinburgh Waverley to promote the reopening of the line. This photo was taken two days before the passenger service commenced. 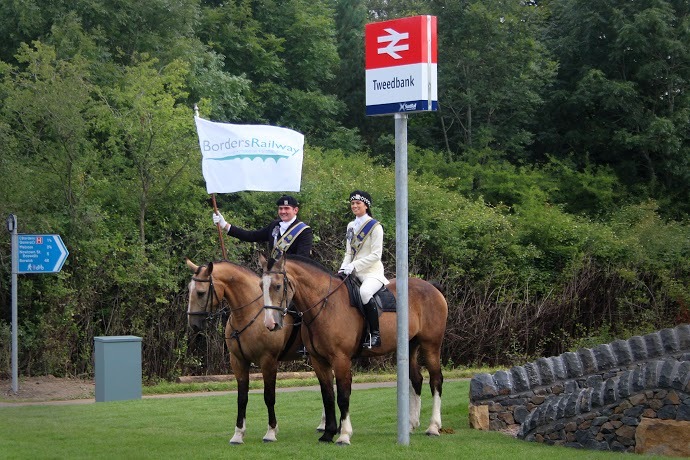 A special train was run from Edinburgh to Tweedbank to publicise the line on Friday 4th September. It stopped at Newtongrange station to meet local schoolchildren wearing construction hi-vis clothing - some of the railway engineers of the future! The last call was at the terminus at Tweedbank station where Cameron Pate and Abbie Frankland, Braw Lad and Braw Lass respectively, of the Galashiels Common Ridings, pose for a photograph. In 2012 consultants estimated that the total passenger return journeys for the first year of operation of the Borders Railway would be 647,136. In the first month there were 125,000 passengers. If patronage continues at this rate (allowing for lower tourist traffic during the winter) it will be more than double that figure. The business case had clearly underestimated the route's potential patronage, predicting only 23,431 yearly return trips from Galashiels station, which is equivalent to only 70 return passengers a day (just three per train). That predicted daily total was so absurdly pessimitic that it is exceeded on just one train, as the photo above shows. Network Rail test train hauled by a Class 37 locomotive runs on the Borders Railway at Stow on 15th May 2015 in preparation for reopening to passengers in September 2015. 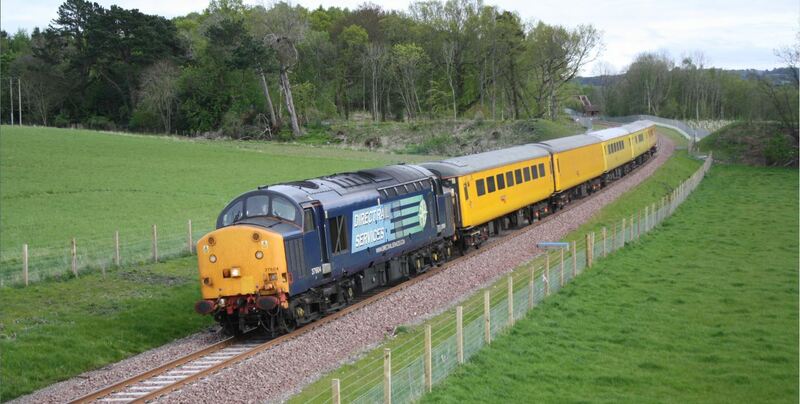 A second shot of the Network Rail test train hauled by a Class 37 locomotive that ran on the Borders Railway on 15th May 2015 to prove that the track was in good condition to carry passengers in September 2015. "There was a prolonged and bitter fight to save the Borders Waverley Line with the final, final blow a warning from the Transport Minister that a private buy-out would have to compensate millions for a new bridge over the planned M6 Motorway. The line officially closed in 1969 and was gone by 1971. This battle strengthened pro-rail campaigners including the Railway Development Society Scotland, the predecessor of Railfuture Scotland. "The next confrontation was in 1984 when the Edinburgh City Bypass was planned to sever the Borders Line trackbed at grade. Campaigners and some politicians demanded a route be protected under the bypass but The Scottish Office were determined that the Borders Railway route would lost for ever. The bypass was built. "The 1990s saw a rise in environmental awareness but although Greater Glasgow had re-opened some city lines the idea of major re-openings was just a dream. Then a smart move by Chris Green of ScotRail and West Lothian Council outflanked The Scottish Office and re-opened to passengers the freight only line between Edinburgh and Bathgate. This proved an outstanding success. Railfuture campaigned for more re-openings. The Railfuture "A to Z of Reopenings" book (since renamed Britain's Growing Railway) for 1988 included the "Edinburgh Sub" as the start of the Borders Line, the 1992 edition had re-opening to Gorebridge to break the City By-pass barrier and encourage Midlothian Council. The 1998 edition had Galashiels as the target. Campaigning was turning to action. 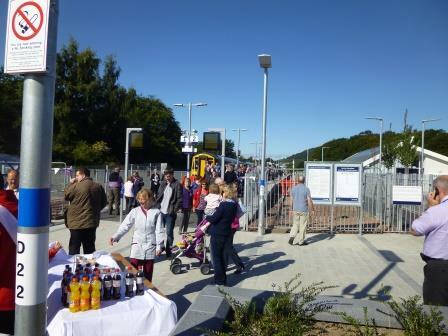 "Railfuture had been engaged on a Bathgate to Airdrie re-opening project. Activists in the Borders asked for advice on costings, which was given, but the Borders Line needed major bridge structures and was a different order of challenge. Borders Railway campaigners came to the fore, including Simon Longlands, Petra Bieberbach, David Spaven and Bill Jamieson. "The Roads Lobby was still on top and opposed rail re-openings, especially "Rural" railways. Scottish Ministers, Scottish Office civil servants and even some Borders Council officers openly briefed against the Borders Railway. Railfuture attended as many conferences and seminars possible to promote the railway. Then government changed and the Scottish Parliament was re-instated after 300 years. For a couple of years nothing happened then the Labour-LibDem coalition turned to railway re-openings. Scottish Borders council joined Midlothian Council in backing the railway 100%. For Borders it seemed a case of when not if. Then SNP won power and cancelled planned new railways but with a slender majority and two Borders MSPs, the new Scottish Government had to accept the railway as a reality but civil servants instigated a series of delays and downgradings. "Railfuture fought these delaying tactics and awarded re-opening grants to the Campaign including the Stow Station campaign. Transport Scotland failed in its attempts to delete Stow Station from the project but won through on its policy of minimum double tracking and building the new railway so it could never be double tracked. Railfuture and its supporter, Claudia Beamish MSP, also fought hard to enable excursion trains to access the new railway. Transport Scotland fought a rearguard action but Scottish Ministers were not to be made fools of and just enough track was added to allow excursion trains to be top and tailed to Tweedbank Station. 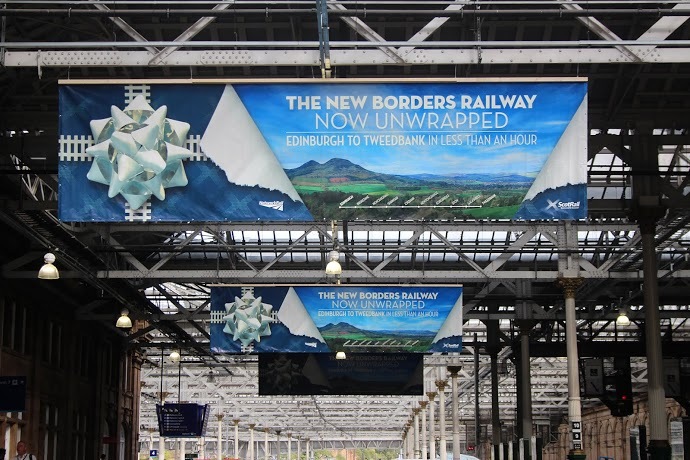 "Despite its deliberately imposed capacity failings The Borders Railway re-opening is an incredible success for its campaigners and also for those elected representatives and professionals who supported it through difficult times. Tweedbank must not be the end of the line." Railfuture Scotland produced a 4-page pull-out about the Borders Railway reopening that was included in Railwatch magazine issue 145 (October 2015). The pull-out included a route map, timetable (up to 12th December 2015), information from the contractors about how the line was rebuilt, quotes from Lord Steel of Aikwood and the Scottish Borders Council leader, plus profiles of three long-time campaigners. The Borders Railway reopening is just one of many successful campaigns by Railfuture, but our success is only possible because people support our efforts by joining us. Annual membership is just £18 (£14 concessions) and gives you four issues a year of Railwatch magazine. It takes just five minutes to apply to join.